If you are looking for a cost effective way to drive traffic into your store, direct mail is a very effective tool to use. Whether you have you own list of customer or you purchase a list, Promotions That Work can help raise response rates to your next direct mail promotion with a contest and guaranteed prize. We’ve got a number of ready-to-play games. You choose the promotion and prize, and we’ll give you a no-risk, fixed fee contest – because we pick up the tab in full when there’s a winner. Our "Give Aways" are 100% guaranteed and underwriten by SCA an international service firm specializing in Promotional Risk Coverage and Technology Solutions for Sweepstakes and Games. SCA has covered billions of dollars in prizes and paid more than $160,000,000 in cash and prizes. Tempe, AZ, May 7, 2009 – Pacific Stereo, of Riverside California, partners with Promotions That Work to launch “The Biggest Sales Event Ever.” On Wednesday May 6th the 4-day promotion was officially kicked off yielding a $10,000 grand prize winner on the first day. 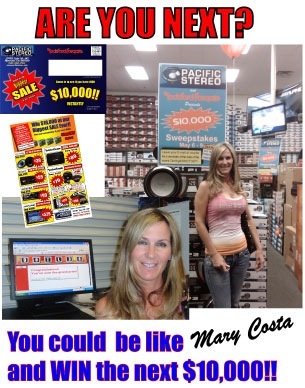 Mary Costa not only got a great deal on a car stereo system but also walked away with one of the grand prizes. “I never imagined this in a million years! I’ve been in this business for a long time and it takes a lot to impress me…this has done it! Customers are not only flowing through the doors but are opening their wallets and purses; We’ve sold a lot of gear in a short amount of time. Going into this I was a little skeptical but Promotions That Work handled everything soup-to-nuts…this is the way I will promote moving forward! 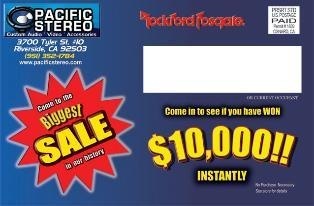 Having a 10k winner on the first day is just icing on the cake!” Stated Ron Alquzah owner of Pacific Car Stereo. The Pacific Stereo event was a custom promotion built from the ground up. Promotions That Work delivered Pacific Stereo an optimized mailing list targeting a specific demographic, circling a 12 mile radius from the event. The list was utilized in a direct mail campaign sending promotional collateral, developed by PTW, to advertise and update consumers about the event. PTW utilized it’s vendor relationships with Rockford Fosgate to build an optimized marketing strategy for the manufacturer as well as the retailer. Along with advertising, for Pacific Stereo and Rockford Fosgate, PTW also built and insured the $10k grand prizes which are the promotional catalyst for the event. “In an ever changing marketplace where customers are a “premium” Promotions That Work focuses on affordable alternative marketing strategies, whether you’re looking for new customers or need assistance in organizing a private sale…we’ve got the solutions from top-to-bottom. You no longer can just advertise traditionally, you need to create custom opportunities that you can promote with…we need to actually drive traffic.” States Rob Wempe, President of Promotions That Work.